NEOKEM’s new website at www.neokem.eu is in line with the company’s refreshed branding, conveying a loud and clear message. It meets the needs of users for ease of navigation, friendly menus with a clear layout, clear titles, and up-to-date content. It expresses the company’s philosophy of offering high-quality products and services which add value to its clients’ projects. 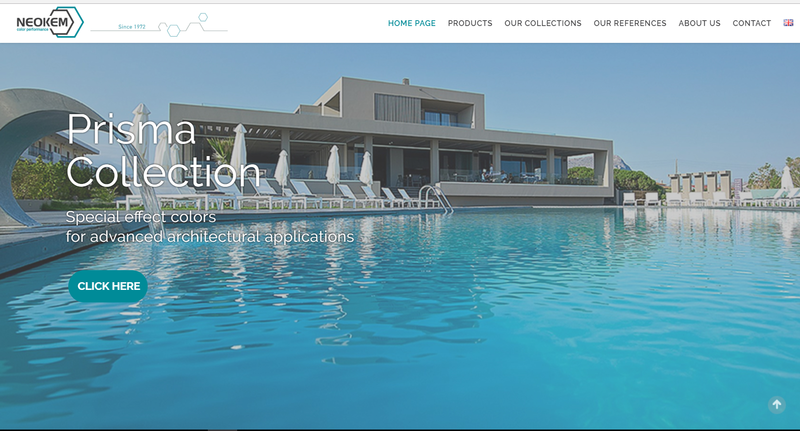 Our new website’s main objective is to place emphasis on Greek and international projects using the NEOKEM’s powder coatings, as well as serving our customers and partners. The website is targeted to coaters, fabricators, architects, hotel owners, as well as households through NEOKEM’s extensive international sales network. It offers the visitor a detailed presentation of each powder coating category, with e–color charts, product tables by application and certifications. Users can browse our brochures to discover the benefits of the NEOKEM’s powder coatings and find innovative solutions suiting their preferences. They can also read interesting articles and posts. The new website is up and running in 4 languages; Greek, English, German, Russian and we go on.